A new stronghold will always make a big impact for a clan, and this stronghold is focused on Fate, possibly the more important resource in the game. At the start of the game you’re going to be down 1 fate, but after your first attack you’ll be even and every province you flip after that first one will get you an extra fate at the start of your next turn. 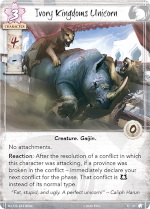 So this gives the Unicorn an incentive to aggressively attack into facedown provinces to generate more fate on their next turn. As your opponent only 4 non-stronghold provinces, the stronghold caps out at 10 gold each turn, which is still an impressive amount. Players have already been planning out what they could do with 10 fate a turn and the openings they could play to allow them to flip 2 or 3 provinces in their first turn. All of this does come at a cost however. You start the turn with 1 less fate than normal, so you’re already playing catch up. You effectively have no stronghold ability, no extra ability to to help you win a conflict or control the board, it’s just a better number when you get fate. To trigger the stronghold you need to aggressively attack into face down provinces. This sets the play-style and leaves you open to your opponent’s province effects. The effect also kicks in later in the game, so there is somewhat of a contradiction as you’re playing an early game style to get a late game bonus. Another, more positive, way to look at this is that you can play aggressively early game without negatively impacting your late game. 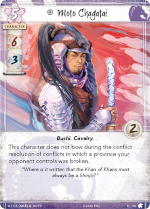 One popular style of play currently is to play conservatively turn 1 to save fate, but with Shiro Shinjo you can play aggressively turn 1 and still effectively save fate. Personally, I think it’s super hard to properly judge this stronghold as it is highly dependent on how the deck is played and whether that emergent play style is effective in the existing meta. The Unicorn definitely favor Military conflicts. Unfortunately, having a deck that is focused on one conflict type isn’t a winning strategy as you’re halving the number of conflicts you can win. This is why many Unicorn decks have been running Courtiers and arguably less efficient characters to try shore up this weakness. Cards like Khan’s Ordu go a different direction, rather than trying to shore up the weakness in political, this leverages the strength in military. As a province it is a little unreliable, requiring your opponent to attack it but there are some ways to increase this with Unicorn: Talisman of the Sun can be used to move your opponent’s attack onto this province and if Border Fortress is face up then it’s action can be used to reveal the province. 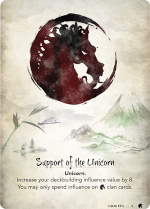 If the Unicorn are prepared for it, a turn of all military conflicts could be devastating. Nothing surprising here. As time has gone on, more and more of the clan support roles are becoming playable. Although there are Keeper and Seeker cards, each clan’s pool of cards grows faster than the role locked cards. The bonus fate from Seeker will remain desirable, but I wouldn’t be surprised to see Support of the Unicorn turning up in decks soon. Dynasty characters that cost 1 are in a weird spot. In theory if they have a decent return on value they are worth it, but often just playing the character gives your opponent an opportunity to pass so making that 1 cost character really cost you 2 fate (1 you pay, 1 you don’t get) and gives your opponent 1 for a total differential of 3 fate. At 1 military and 0 political skill, the Stallion isn’t here for skill alone. It does allow you to move the Wild Stallion and any other character you control into the conflict. So it is good against send home, allows some assignment tricks, and lets you get a bowed character into a conflict. As a conflict character it would be awesome, as a Dynasty character I’m less impressed. On a side note, is it weird the horse doesn’t have Cavalry? Surely it can keep up and do all the things that Cavalry characters do but better! A character with 3 military and 3 political for 1 cost is a stellar character. At 2 cost, it’s a little less good. Still, this 2 cost character is flexible and does have the Cavalry trait for abilities that require it. There is a drawback, but having to be in the first conflict every turn with such balanced stats isn’t terrible. That said, this isn’t a Doomed Shugenja or Ethereal Dreamer. One thing to watch out for, is when players forget to assign the Young Warrior into the first conflict. Our recommendation for players (and Judges) is bow and return home the Young Warrior if they should end up in any conflict but the first and make no further adjustment (i.e. don’t redo the earlier conflict). Another 2 cost character focused purely on stats. In this case the Trailblazer is a 4/3 when you declare them against an unrevealed province and 2/1 otherwise. That is a step above the Young Warrior and ties in neatly with the new stronghold. Everything going well, you’ll be breaking every province you attack, so the bonus should continue to be active. That 4 military is also quite nice for breaking the majority of provinces. So despite it being a limited bonus, it is probably going to be active all the way until the last attack as you break your opponent’s stronghold. Where the trailblazer reveals provinces by attacking, the Farseer takes a different approach. 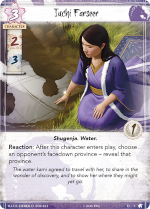 After they enter play, you get to reveal a facedown province, essentially getting an extra +1 to Shiro Shinjo just by playing this 3 cost Shugenja. Under Shiro Shinjo then you could consider this to be a cost reduction that slowly returns. So if you make this 2/3 character turn 1, you’ll get your fate back at the start of the 4th turn. As a Shugenja she supports several key cards like Cloud the Mind and Force of the River. Looking just at the ability, it obviously gives you a lot of information something that other clans were splashing Iuchi Wayfinder in to get. Although the era of the nightmare Dragon row is gone, provinces can still have big impacts on games and knowing what’s there is a big benefit. As this character will typically enter play during the dynasty phase, it will fizzle many on trigger effects like Rally to the Cause. 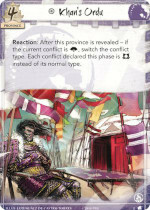 Players have often dreamed of a card that will reset a province, up to now the Kitsuki Yaruma’s entering play effect was it. With Saadiyah al-Mozedu, the Unicorn have a version with much more utility and control. In addition, this character has Sincerity meaning you draw a card when she leaves play. At 3 cost she is at one of the preferred costs, cheap but still outside of Assassination range. As a Courtier with 0 military and 3 politics she helps with the Unicorn weakness rather than focusing on its strength. That said, the range of Courtier characters has been steadily increasing for the Unicorn and while it’s clear military is still their strength suggesting political is their weakness might not be true any longer. The ability is two fold, it lets you ready your own abilities for another trigger, such as Khan’s Ordu, and it turns your opponent’s provinces face down either to deny the action like Magistrate’s Station or to ready them for another attack by a horde of Trailblazers. This Shugenja continues the revealing theme with an ability that gives +1 military for each faceup no stronghold province, so between 1 and 4. At 4 cost with a 3/3 he is a decent investment stretching out to a potential 7 military. As is common with Shugenja, Daiyu does not have to be present in the conflict, so you can leave that bonus to ‘float’ where it is needed. This may often end up missed by your opponent. 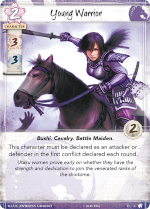 This also provides a great way to mini-tower a character when needed, getting your military skill ahead for cards like Rout or duels. Is this the Khan we were promised? 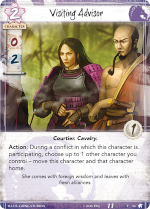 At 5 cost this is another clan champion level character, with 6 military Chagatai is bringing considerable military skill to the fight, but just that. His ability is a ‘win more’ ability, if you break one of your opponent’s provinces he doesn’t bow. 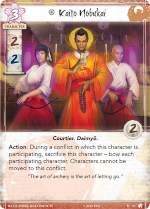 In theory, this could mean he participates in 3 conflicts (using the Hisu Mori Toride stronghold) in a single turn and doesn’t bow in any of them. That said, if that does happen you’re already doing very well. The obvious comparison is to Shinjo Altansarnai who also has an ability that triggers on breaking a province. She quickly fell out of favor when it became clear that the Unicorn struggled to even win a conflict let along break a province. That was then though, and now things are very much different. 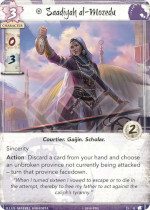 Altansarnai’s stock has increased slightly as the rest of the deck has gained strength and breaking a province isn’t a far-away dream. Similarly, Chagatai needs to be evaluated within the current decks rather than decks from a year ago. 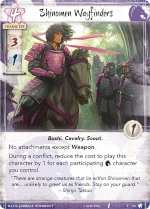 With a lack of Unicorn restricted cards, they are one of the few clans with the freedom to run restricted neutrals like Charge! 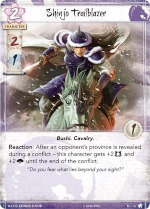 Chagatai specifically is a fantastic card for Charge! as not only will he help break the current province but he will continue to be useful for another conflict. 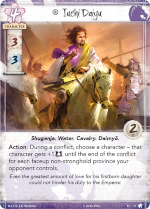 Earlier I suggested Chagatai is a win more card, and that certainly is the case but unlike Altansarnai he pushes the deck on to the next phase. Where Altansarnai provided an extra benefit, Chagatai generates momentum. 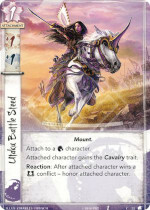 Especially with Hisu Mori Toride he has the potential to accelerate the Unicorn game by an entire turn. This 6/6 for 6 character is just a big stick of stats. The ability is a coming into play one, similar to the Scorpion’s Ignoble Enforcers. Where the Enforcers require a decision on the owner, Aranat requires a decision on the opponent. You can choose to reveal any of your face-down non-stronghold provinces and deny Aranat extra fate but power up Shiro Shinjo for next turn. Obviously, this is at it’s most effective turn 1 when your opponent needs to decide between splitting that 4 fate between Aranat and Shiro Shinjo. The amount of potential fate for Aranat diminishes as the game goes on, but then there are less turns remaining in the game so that’s not necessarily a bad thing. 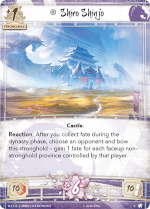 Although you might make Aranat on the last turn, when everything including your opponent’s stronghold is unrevealed, typically you’re going to get at least 1 fate on Aranat as your opponent doesn’t have the option to reveal their stronghold province. If you’re facing against this turn 1, it really is a tricky decision. Certain provinces like Magistrate Station could be desirable to reveal. If you play a Seeker role you could reveal a province of your roles element and gain a fate. Not revealing a province will give Aranat 1 fate while revealing a province will give your opponent 1 fate every turn after that. That 1 fate on Aranat is an extra turn of a 6/6 character though, so the value of that fate could be much more than one in the pool. Right now, I suspect revealing as much as possible is the right call, the Unicorn player is going to be pushing for that anyway so we might as well get it out of the way. This Crab clan Bushi gets +1/+1 whenever a character is moved or played into the conflict. Crab are not known for their movement tricks, so this typically will be dependent on conflict characters. This benefit is triggered by your own conflict characters but also your opponents, essentially devaluing those 1/1 conflict character that are so popular. At 4 fate, you need some way to make the ability a little more reliable to get some return on your investment. The Crane really can’t get enough of honoring effects. With decent glory across all their characters and effects that rely on those characters being honored it is a key element of the deck. 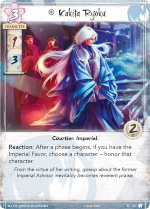 This 3 cost 1/3 Courtier will honor a character every turn if, and only if, you have the Imperial Favor. If you have it at the start of the turn you can use the reaction at the start of the Dynasty phase, or the Draw phase if you’ve just made Ryoku. If you don’t start the turn with the favor but manage to get it at the end of the conflict phase, then at the start of the fate phase you can use the ability. That makes this character a lot more reliable than many of the effects that require having the favor. 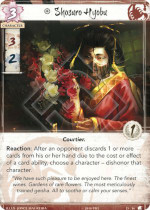 As a Courtier has a desirable trait and although the 1/3 stats aren’t amazing the fact that Ryoku will often self-honor into a 3/5 changes that value significantly. The 2 cost range is a problematic one, these characters should be better than a 1 cost character but are still vulnerable Assassination and end up with a great sunk cost if killed. At 2/2 Taiko stats are somewhat better than the 1/2 or 2/1 that we often see in this price range. The 0 glory can be seen as a benefit as much as a drawback. The ability then is the real focus for this character. When Taiko comes into play you can choose a non-stronghold province and prevent it from being attacked. Typically, this will target a revealed province forcing your opponent to attack blind into one of your unrevealed provinces and hopefully directing them into something nasty like Restoration of Balance. 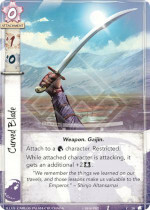 As a unique character you’re only going to be able to play one of these a turn, preventing more than one province being targeted in a single turn. Unfortunately, this also means you cannot play another copy if you already have Taiko in play which means you have to use this as a throw away character with 0 fate if you want to get the effect on subsequent turns. Taiko doesn’t fit into any of the current Dragon decks and as the ability is not something you can reliably use effectively I’m not expecting this Bushi to see a lot of play. For 3 Fate, you get a conflict wide bow effect. On the defense, this will save a province. If you have the favor and this is the right conflict type, then that +1 bonus will win you the conflict. Even better, for the Phoenix at least, if you have straighten effects you can ready your biggest character and now you’re breaking provinces. More common, and where Phoenix could be worried are conflict character. This might actually encourage Grasp of Earth seeing some play. All in all, this is a pretty scary character. On the other hand, this is a Courtier and not a Shugenja which makes it less desirable for the current deck that likes to abuse Supernatural Storm. The stats of 2/2 for 3 isn’t worthwhile in itself and if your opponent is able to straighten more skill themselves, then you’ve just lost the conflict. Overall, this a similar card to Isawa Atsuko who is in decks for that final conflict when it is all or nothing. 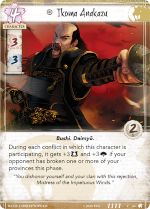 That Nobukai might not make the cut in the primary Phoenix deck says a lot about the power level of that deck. This does remain a powerful card and may see a place in a Courtier focused deck. At 3 cost for a 3/2, this character doesn’t have terrible stats and if you are able to leverage the dishonor effect each turn then the penalties you’ll be inflicting on your opponent will magnify this. The effect is remarkably specific, it has to be the cost or effect of a card ability so you’re not going to be able to trigger it from Ring of Earth. Options include Spies at Court, Policy Debate, Oracle of Stone, and Shosuro Miyako (if your opponent mistakenly chooses to discard). That is really poor, while your opponent may have card effects themselves that will allow you to trriger the ability that isn’t something you can rely on. Unless Scorpion get some ways to proactively trigger the effect, this will remain in the binder. This neutral character has already sparked some interest with the military focused clans (Unicorn, Lion, and Crab). Getting two military conflicts is great and Hisu Mori Toride can make that a third! Despite the nasty – political skill, the 4 military for 3 fate is actually decent. With 0 glory, being dishonored isn’t a big deal and with the no attachments clause this unicorn isn’t going to get clouded. The ability is a big risk big reward scenario, if you want to make sure to trigger the ability you need to commit to breaking the province but if you want to maximise the benefit of the ability you need to retain military strength for the next conflict. As the next conflict starts immediately, you don’t have the option of using straighten effects. Instead, you’re looking for effects that prevent your characters from bowing or moves them into the conflict and straightens them. 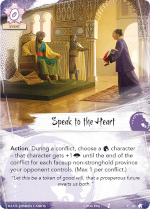 This two cost conflict Courtier gives you the option to move the advisor and one other character you control out of the current conflict. This gives you the option to over-commit and then pull back if your opponent doesn’t defend or once it’s clear you’ve lost a battle. 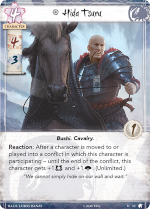 As a Courtier character, this does make Courtier cards a lot more reliable for the Unicorn clan. This 3/1 conflict character sits in an interesting position. Being able to drop 3 military into a conflict is great, but 4 cost is way too much. This character does have a cost reduction for each Unicorn character you already have in the conflict, so if you have 4 characters already then this is a 0 cost character. That puts this card in an interesting position. Conflict characters are often best when you don’t have characters in the conflict or to declare a conflict. The Wayfinders aren’t going to be any good for that. Conflict characters typically are less good when you already have lots of characters in play, often an attachment or event will have more impact then. The Wayfinders are cheaper then and are just shy of a Banzai! effect without a once per conflict limitation. Possibly one of the best ways to play the Wayfinders then is to play them at home during a conflict when you have 3 to 4 characters already. This leaves the Wayfinders ready for a later conflict. At 0 cost for a 3 military weapon, this is better than Fine Katana for Unicorn. Wow! That only works on the attack however, on the defense it’s a 0 cost 1 military attachment making it worse than a seal. A very popular card to splash is the Crab attachment reprieve. It can be destroyed to prevent a character leaving play. It provides protection from character destruction and essentially gives an extra fate for the character. 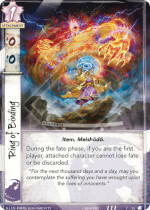 The Ring of Binding doesn’t have the destruction protection but as it also prevents fate being removed and it doesn’t leave play itself it can end up saving 2 or more fate over the course of a game. Playing this turn 1 on a character with 2 fate makes it likely that character will still be in play on turn 5. So this is a straight 3 of in Unicorn decks although at 3 influence it is less likely to be splashed. Although not often used, there is an action window at the end of the fate phase, so Mono no Aware could be played then with the characters with Rings of Binding ignoring the effect. As this would be after the normal fate removal, this isn’t going to be particularly effective as characters that were on 0 fate when Mono no Aware was played will still stay around. More effective is the void locked Phoenix card Jurōjin’s Curse which triggers an extra fate phase. As the Ring of Binding characters don’t lose fate, they won’t care but everyone else will. Even at the end of the next turn when you aren’t first player, they’re only losing the same amount of fate as they should have. Then the turn after they’re immune to the effect. Three turns of double fate phase is going to destroy most decks. Phoenix and Unicorn decks with the Void role are going to be a real concern. A 1 cost +1/+1 attachment isn’t amazing, but it’s not terrible either. This attachment can only be used by Unicorn characters, so despite the 1 influence it isn’t going to be splashed. Adding the Cavalry trait may help round out some Cavalry related effects but it isn’t going to help with Cavalry Reserves which is always going to be the main reason for Cavalry. The ability to honor the character after wining a conflict will be great with the newly developing range of Battle Maidens which have high glory to benefit from the effect. This could also work quite well with the Giver of Gifts who can move it along to the next character who needs to be honored up. Politics had been a weakness of Unicorn, but Speak to the Hearth certainly goes a good way towards fixing that. While initially this is going to be a +1 political skill boost, with the Unicorn emphasis on revealing provinces this could quickly turn into a Unicorn Banzai! for politics. 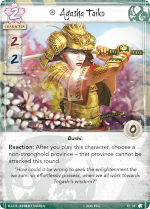 At 1 influence it could be splashed, but it is unlikely that other clans are going to be as aggressive in revealed provinces so it will have much less utility outside of Shiro Shinjo. If you win a military conflict as the attacker, you play this card (losing a card) then draw 3 and discard 1. So you’re up one card but the card you end up discarding doesn’t have to be one of the new cards so it’ll be the worst card you had already. The effect is actually pretty decent and the trigger is something you should be actively trying to do anyway. 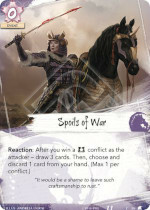 The only difficulty is if you end up with Spoils of War as a blank card in hand as it’s not the card that would have let you win the conflict in the first place! That said, even as a win more effect it’s pretty decent and it doesn’t require breaking a province just winning the conflict. 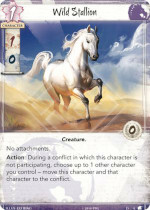 This should be a solid addition to the Unicorn deck, but I suspect many players will consider cutting it as space grows tight. For 2 fate you can completely reassign all of your Cavalry characters, either removing Cavalry characters or adding them as needed. In addition, you’re able to trigger any movement effects such as Spyglass. This will make for a pretty strong finisher letting you feint with everyone and then leave your opponent’s defending army outmanoeuvred. 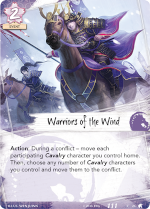 In theory this has some synergy with Cavalry Reserves and Charge as you can use them to bring political focused characters into play and then move them out for a later political conflict. That said, Unicorn are more likely to just crush you beneath the hooves and leave the courts to another clan. While at first this Lion Bushi looks lacklustre, once you realise he is a conflict character he has much more potential. At 4 cost he’s a bit expensive for a 3/3 character, but if your opponent has broken a province he suddenly becomes a 6/6 character for 4 which is a much better investment. He does provide a nice option for Lion, but the 4 cost is always going to make him difficult to play. He doesn’t have the same massive impact as a character like Bayushi Kachiko, but he is a solid addition. At 0 cost for a +1 politics, this attachment is similar to an of the clan seals. The effect itself is very minor giving some sorting but only if you reveal a province with the attach character participating. If this card had no such requirement and let you filter the top cards of the deck it could see some play in combo decks or just as a general quality control. It could still be played that way, but does prevent safe farming of revealed provinces which adds significant risk for minimal advantage. Where it would be of the greatest benefit is in decks that force 1 bids. 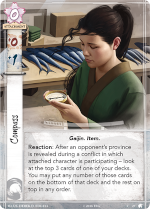 In those kind of decks however, drawing a Compass in your 1 card for the turn is going to put you at a significant disadvantage. Of course, Compass is in the Unicorn pack because of Spyglass. Although the Compass reaction happens after the province is revealed and Spyglass reacts after the attached character is committed, the timing window for this stage is actually a little more fluid so you could use a Compass, then a Spyglass, then another Compass, followed by another Spyglass. This two-card combo is pretty useful letting you draw the best out of those 3 cards when you attack. Compass is the limiting factor however, if you draw it too late then you don’t get to trigger it as the provinces you’re attacking are likely to already be revealed. If you draw it early without the Spyglass, then it is less effective than almost any other card you could have drawn. 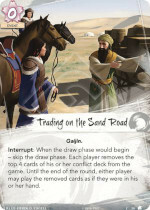 Trading on the Sand Road is another neutral card that has players excited, apart from perhaps the Jigoku team who are going to have to work out how to implement this. Rather than bidding, each player takes the top 4 cards of their deck and adds them to a shared pool. Decks that have very restrictive cards are going to benefit the most from this as their opponent will have limited options. This also takes away the bid phase, so the no honor is transferred and the current bid dials (if any) remain unchanged. During the action windows the active player will have the first opportunity to use one of those cards and during conflicts the defender will. Overall it looks like a pretty great pack for the Unicorn. 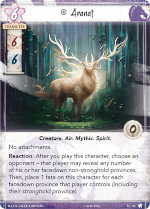 We have the Crane pack due out soon and then after that the Inheritance cycle, so the environment is due to shift pretty fast but until then it looks like the Unicorn are in a great position to win some tournaments. Warning: Audio bad in more than a few spots!